My daughter was off to college and my wife was deep in women's volleyball season, leaving me at the start of the Fall tons-o-free-time season. I had a backpack trip to SEKI NP planned for the weekend, but wanted to do some dayhikes beforehand. 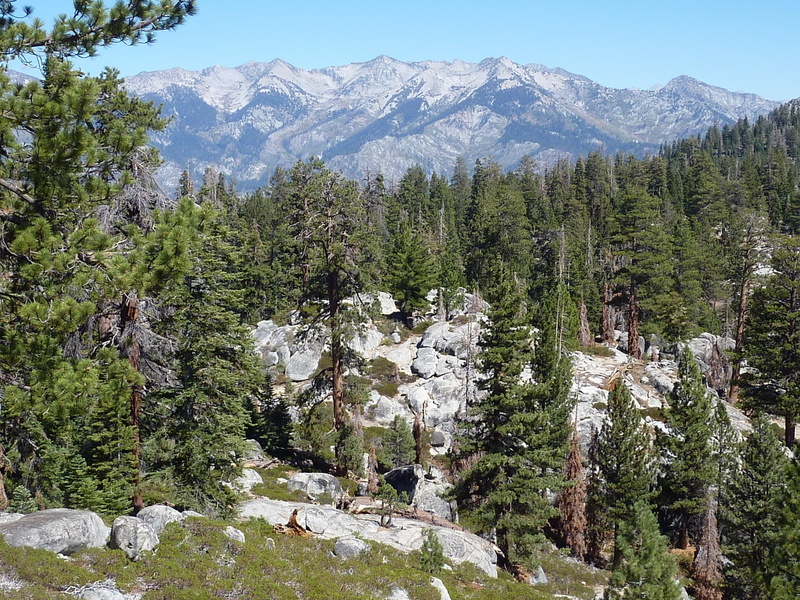 Today's collection are found in the adjacent Sequoia National Forest. Most were pretty short, less than a quarter mile, but due to a road closure (reason not obvious), I did get in a 5mi+ hike to tag two of them. Leaving San Jose around 6a, it would take me something over four hours of driving to get to the first hike. This 4mi-long ridge is found north of SR180, before reaching the SEKI entrance booth. The access road is partially paved, but becomes decent dirt road about a mile before reaching the ridgeline at a saddle between the two summits. Fire burned over the northern half of the ridge a few years ago, leaving lots of standing snags which mar views from the grassy summit. The southern summit didn't burn, is a bit brushy, and also has poor views. Several hunters were out driving slowly along the roads, decked out in camo gear and looking for easy marks. Gotta love deer season. The rest of the peaks are located in that part of the national forest on the other side of the SEKI entrance, one of the few forest areas you have to pay national park fees to visit. This summit was the furthest east, 10mi out along Big Meadow Rd, used to access the Marvin Pass TH and Lookout Peak. The pavement ends at Horse Corral Meadow, but a good dirt road continues towards Lookout Peak. A rougher spur road gets one to within 1/4mi of the summit to the northeast. Careful route-finding keeps brush (manzanita & buckthorn) to a minimum, same for the rest of these peaks. A granite outcrop of large rocks marks the highpoint with nice views of the Monarch Divide. This one is about 5mi west of #1. Good dirt roads get you within a mile of the summit on the east side. The Buck Rock Jeep Trail (rated most difficult with lots of warnings) goes over the summit west to east. I used this to drive to within about 20ft of the summit, another granite outcrop atop a modest granite dome. The driving was more fun than the exceedingly short scramble. This closely-spaced pair of summits are found a few miles northeast of the Buck Rock lookout. A good dirt road goes over the saddle between the two, but was not currently driveable. It was gated at the pavement, about 2mi short of the saddle, a sign simply saying, Closed to the Public. Not closed to the ranchers who manage the many cattle that graze in the area, however. I parked at the gate and walked the road, past several lovely green meadows that were surprisingly devoid of cattle (though they had magically appeared on my way back). Like the previous two peaks, and most of those in this area, the summits had granite rock outcrops, short scrambles with moderate views. None of the peaks are particularly high, leaving views to the south blocked by Shell Mtn (kinda boring), and to the west by Park Ridge. Kings Canyon lies not far to the north and northeast, but views are mostly blocked by trees with occasionally good views of the Monarch Divide, especially Wren Peak and Eagle Peaks. Peak 8,180ft also featured a view up the Middle Fork of the Kings River where the Obelisk, Tehipite Dome and Kettle Peak can be seen with higher peaks in the far background. This minor summit is found about 4mi south of Hume Lake. Driving is trivial along Hume Lake Rd to a primitive campground on the south side of Lava Butte. The hike is similarly trivial, less than 1/5mi. I found a convenient use trail leading through some thick manzanita to the impressive summit block some 40ft high. I went up a class 3 route on the southeast side, reaching the perchy summit, half occupied by a sad, old oak tree covered in parasitic mistletoe. There is an easier class 1-2 route off the north side I found on the way down. Nice view of Buck Rock from the summit, but not much else.